Overlooking Bang Tao Bay in Phuket, Vichuda Hills Villa is a luxurious, island-friendly property with an infinity pool and state-of-the-art facilities for the best tropical adventure of your life. 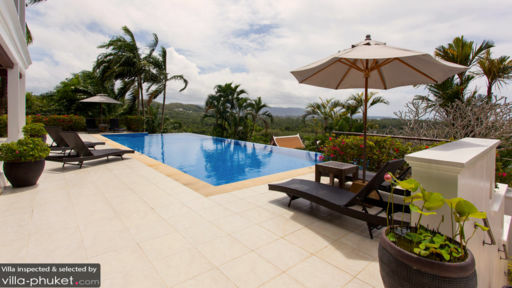 The four-bedroom property features a TV lounge, furnished terrace, opulent living and dining spaces, as well as many open-air lounge areas where guests can relax together with drinks, music, and food. For entertainment, guests are free to explore the nearby beaches and restaurants that serve freshly-prepared meals with an abundance of local flavour! Found on the first floor, the four, spacious and fully-furnished bedrooms at Vichuda Hills Villa are also adjoined to a living area with proper sitting for a more private and intimate setting. The bedrooms are minimally furnished with double beds or twin-beds with comfortable mattress for a good night’s rest. They have large windows which allow for ventilation and natural lighting that streams inside. Chairs and tables are placed in the bedrooms and there is ample wardrobe space for all your belongings. A high-soaring ceiling adds the final touched to these classic and elegant bedrooms. En-suite bathrooms are fitted with showers and other amenities. With stunning views of the lush tropical greenery in Phuket as well as Bang Tao beach, the infinity pool at Vichuda Hills is the place to be if you want to catch the early sunrise or sunset. The gorgeous view only adds to the enchanting experience as you young in the pool or lie back on the sun beds found on the pool deck. As you work on your holiday tan or take a much-deserved mid-afternoon siesta, the fresh island breeze will keep you cool and refreshed. A verandah that also serves an excellent spot for splendid views is connected to the lounge. The contemporary and elegant living spaces at Vichuda Hills feature hardwood flooring, polished to a perfect shine, selective artwork on the walls, sliding glass doors that lead to the infinity pool and verandah, and spot lights that cast a warm hue on the entire room. It is furnished with comfortable rattan sofas with plush cushions for you to rest on as you enjoy the spectacular view outdoors. There is an eight-seats dining table just beside the sitting area where everyone can eat together. Towards the corner, you will find the entertainment room with a massive flat-screen TV, sofas, and pool table, opening out to the veranda. At the other end of the villa, there is a state-of-the-art kitchen with modern amenities and special appliances for your convenience and use. There is another smaller dining area for quick bites and to-go breakfast when you’re in a rush! A covered terrace furnished with comfy sofas is where you can lounge in the evening with friends and family. The air-conditioned villa offers many excellent amenities and services to guests so they can have a worry-free time during their holiday. The staff does its best to help you get settled in and even recommend places to see and visit around the area. Laundry facilities, free Wi-Fi, and parking are available as well. 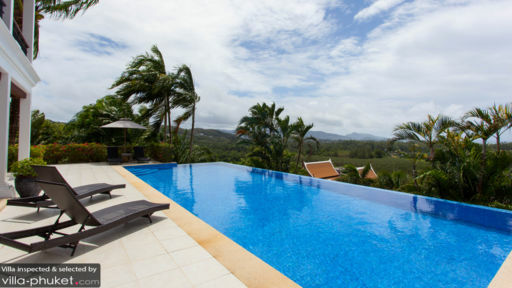 Located overlooking Bang Tao bay in Phuket, Vichuda Hills Villa is close to many of the main beaches in Phuket including Layan and Bang Tao beach, as well as the popular Laguna Golf Course. There are numerous beach clubs and restaurants to try out especially once the sun sets! A nice place for relaxing with the awesome housekeeper help us cook the food that we order. A very clean accommodation but only the transportation not convenient.... have to book transport to city.